Ghost was one of the first ever seal mums that I identified back in 2003. In 2016 she remains a very special seal mum who is a Cornish record breaker! We are trying to establish if she is perhaps even a world record breaker! 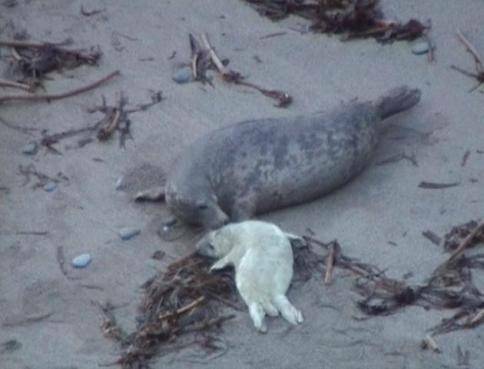 I first saw S112 Ghost on a magical Bonfire Night in 2003, when I spotted her with a stunningly gorgeous three day old fluffy white coated seal pup at the West Cornwall haul out beach. After 18 days of successfully rearing her pup, Ghost disappeared from the area completely, leaving her pup full of fat reserves to sustain it through the next few months when, like all young independent grey seal pups, it would have to teach itself to feed. 2003 (left) and 2004 (right) pup. Can you see Ghost’s sideways facial skull pattern on her flank? 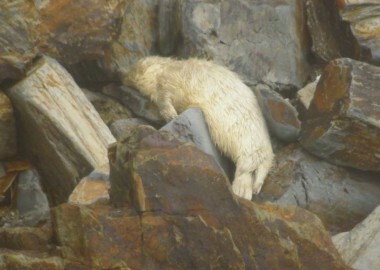 Ghost reappeared the following year in the very next cove, where she had her pup on 21/10/04. This pup grew quickly and was successfully weaned almost 3 weeks later. Again Ghost left the area and wasn’t re-sighted until 22/10/05, along with her next pup, who was thought to be about 5 days old (born around the 17/10/05.) On the same beach as the previous year, her pup looked just as healthy as her two previous ones – they were all beautiful pups, fluffy, cream and perfect. 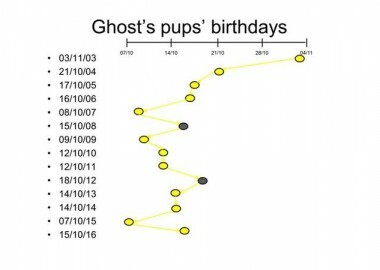 After her now routine disappearance, Ghost returned in 2006 to have her fourth pup. 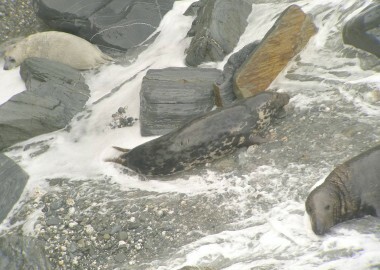 This was born on 16/10/06 on exactly the same beach as her last two pups with business as usual for Ghost. She worried us in 2007 though when her pupping date came and went and there was no sign of Ghost. 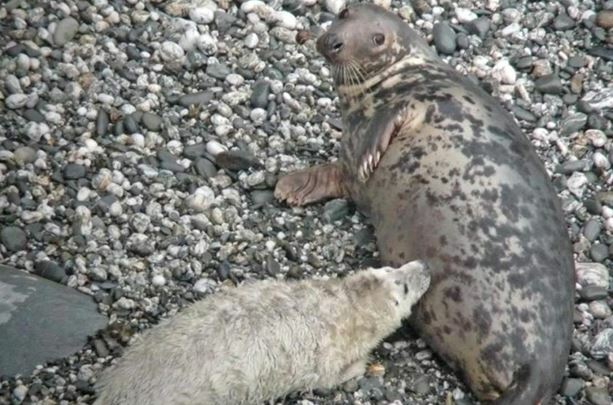 It turned out she was just being elusive because on 22/10/07 she suddenly appeared from the back of her pupping beach feeding a supremely fat and healthy pup who she appeared very proud to show off! 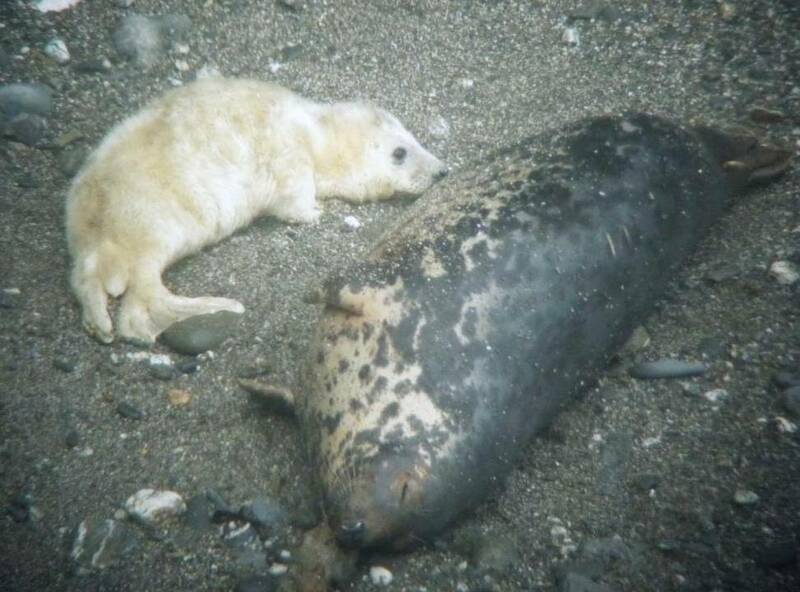 She had been hiding her pup for at least two weeks! We named him Spirit! 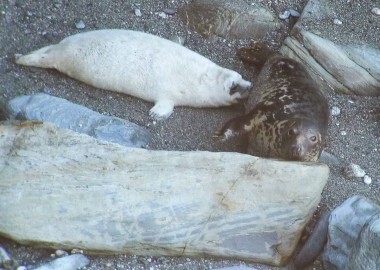 Perhaps Ghost had been more secretive because for the first time Ghost had company on her pupping beach – two other females with their healthy pups. Five pups in five years in virtually the same place. This seemed something of a landmark achievement for Ghost and us! Ghost was the first recorded example of breeding female showing site fidelity for Cornwall Seal Group Research Trust, although site fidelity is accepted behaviour for pregnant females. 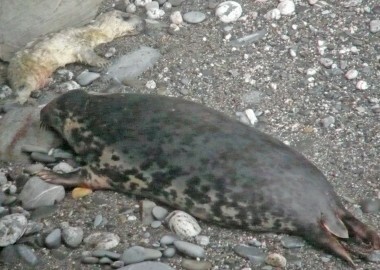 Mums are even thought to give birth on the same beach they were born on. More recent CSGRT experiences, however, show that it is a little more complicated than this with several females giving birth at widely distant locations, sometimes even in different countries! 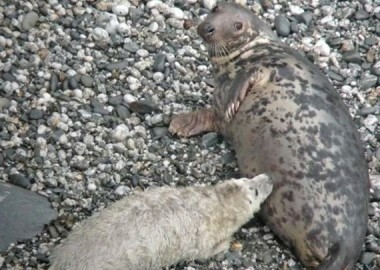 Seal mums it seems don’t always read the ‘seal’ textbook! Ghost had become somewhat of a local celebrity and her return was eagerly anticipated every year. 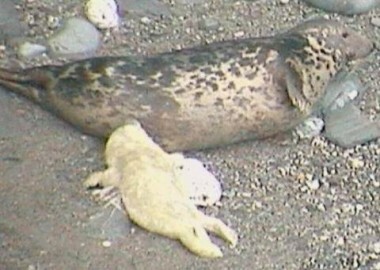 She had her pup Seaspray on 15/10/08. 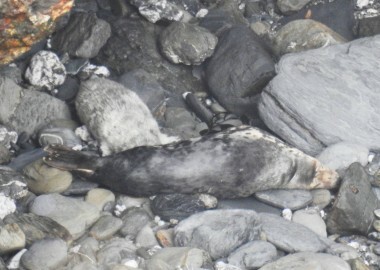 Sadly however, this pup died during its first night along with three other pups in the area in one night when high tides combined with very rough seas, making it too hard for their mums to keep their pups out of the crashing waves or their eye on them when washed into the surf breakers. It was heartbreaking to watch Ghost return to the body of her dead pup for the next 15 days, so strong was her instinct to feed her pup. 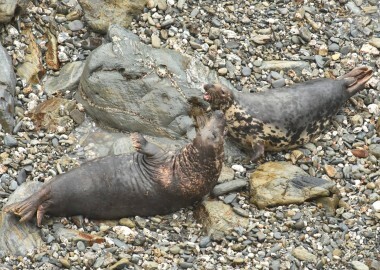 Ghost feeding few days old Lychee in 2009 (left) and Iolite in 2010 on an adjacent beach (right) where Ghost had found him after he had been washed out in a storm! We were hugely relieved when , despite a massive rockfall on her pupping beach, ghost returned again to give birth on 09/10/09 to a pup we called Lychee. 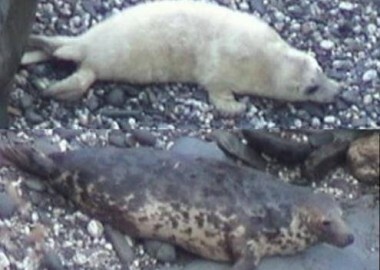 On 12/10/10 Ghost’s next pup, Iolite was born, followed by Lampard on 12/10/11. Lampard seemed to be her biggest pup yet. He grew so quickly that he was almost the same girth as Ghost by the time he was weaned. We had seen Ghost serenely resting in a coastal rock pool the day before giving birth in 2012 and returned with great excitement the following day full of anticipation, only to have our hopes dashed as we saw her pup’s young body floating lifelessly in the shallows. 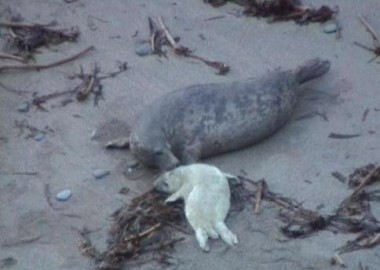 Sadly Ghost’s 2012 pup had died in a storm, but this was her 10th pup in 10 consecutive years! 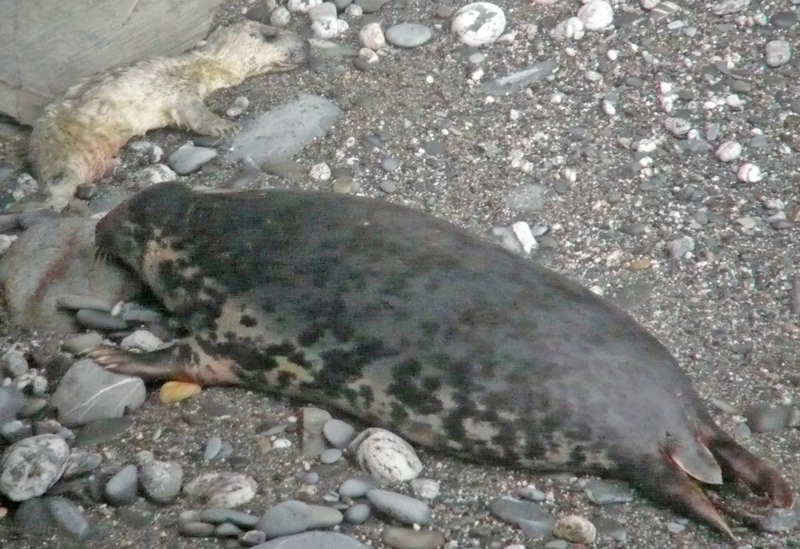 With grey seal pup mortality rates of 15% on average during their first three weeks, this could have been expected. However, since then Ghost has gone from strength to strength. 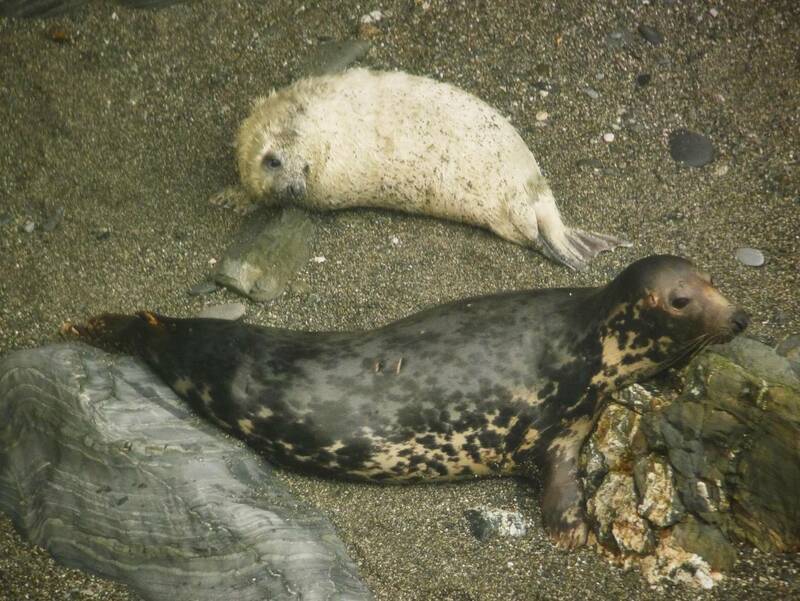 In 2013, her pup Veor was born on 14/10/13 and we discovered who her chosen Beachmaster male was – DP2 White back C (a seal known to CSGRT since 2000). 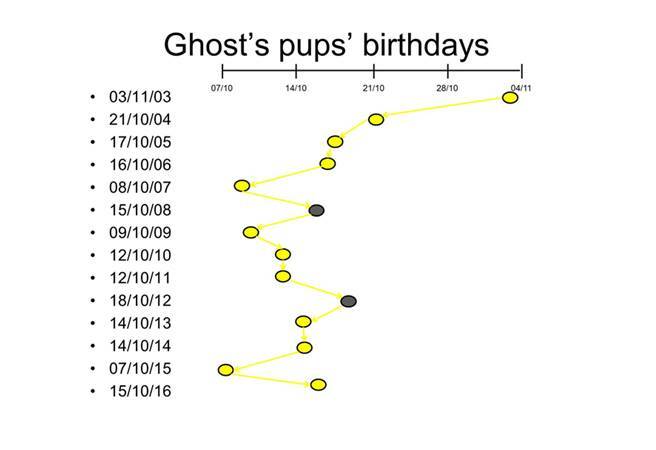 In hindsight we realised that DP2 had been the father of Ghost’s pups since at least 2010. 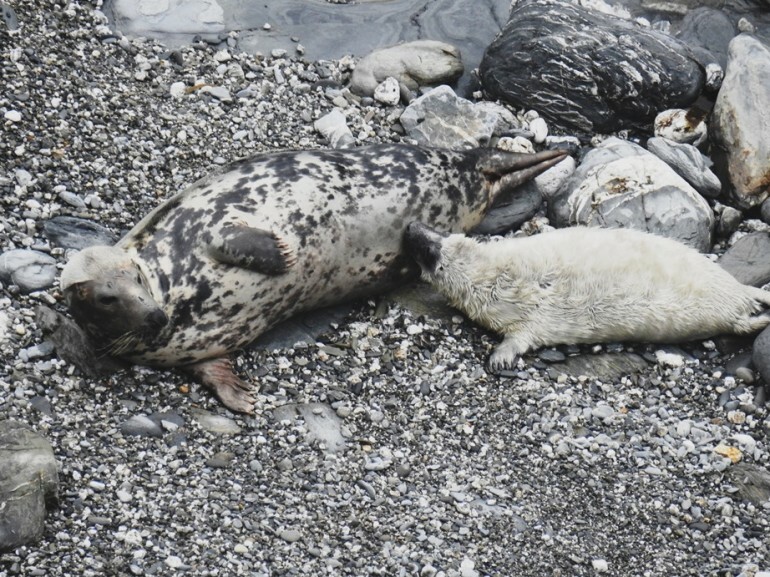 An elderly male, White Back C only appeared to return to beachmaster for Ghost, mate with her and then leave with her, presumably no longer having the strength to sustain beachmastering at the pupping site for any longer. He did this in 2013, 2014 and 2015.Each year we watched her asserting herself over White Back C despite his considerably larger size. She loved giving him a mouthful during his routine checks on her whereabouts and condition. 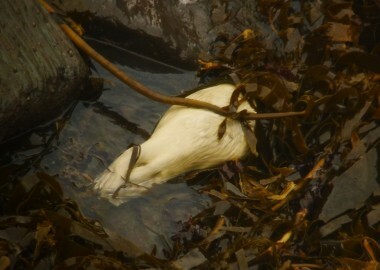 Ghost had repeatedly propped herself up using rocks as apparent pillows and with a runny nose we did wonder if Ghost had a respiratory infection backed up by the fact she appeared to spend more time with her pup on the beach this season. Ghost giving White back C grief in 2014 (left) and again in 2015 (right) – she is howling at him in both these photos! So we were hugely relieved in 2014, Ghost had her pup (called Mallard) on exactly the same day just a year later 14/10/14. We were now getting used to her routine. We have only ever seen Ghost in October and November and unusually she has never been identified at any of our other photo ID sites around the southwest. 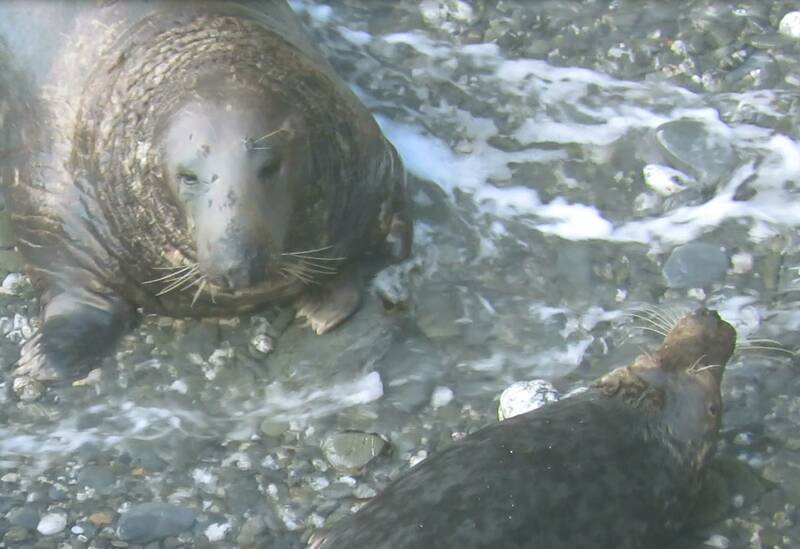 Her pupping dates seem to have narrowed down to a preferred pupping window of a week between 8th and 15th October most years. But, just as we thought we had her routine sussed, Ghost surprised us all again by having her earliest ever pup on 07/10/15. 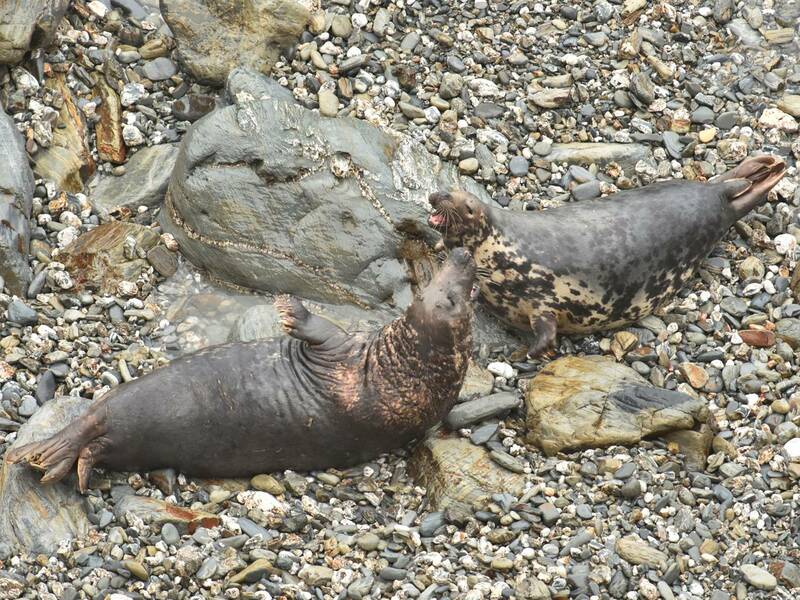 This pup (like her pup the year before) had an uncomfortable time, balancing on a huge rockfall on Ghost’s chosen pupping beach. So severe had the fall been that the coast path had been permanently rerouted in land. 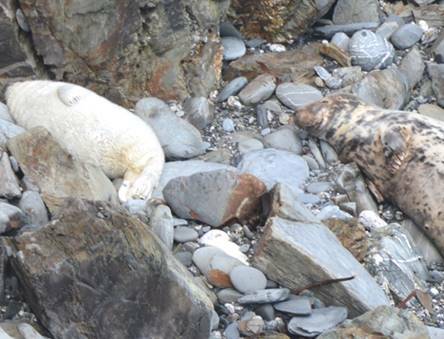 Geoff Rogers (one of our volunteers) got the best photos of Ghost and her 2015 pup mirroring each other with Ghost protectively lying on her pup’s seaward side. As I watched Ghost follow her usual route through the boulders back to sea as she left the beach around the time of her weaning her pup in 2015, I made a real point of appreciating the moment and registered just how much Ghost had taught us about grey seal mums and pups. I wondered if I would ever see her again and just how sad I would feel if I was not to see her again. 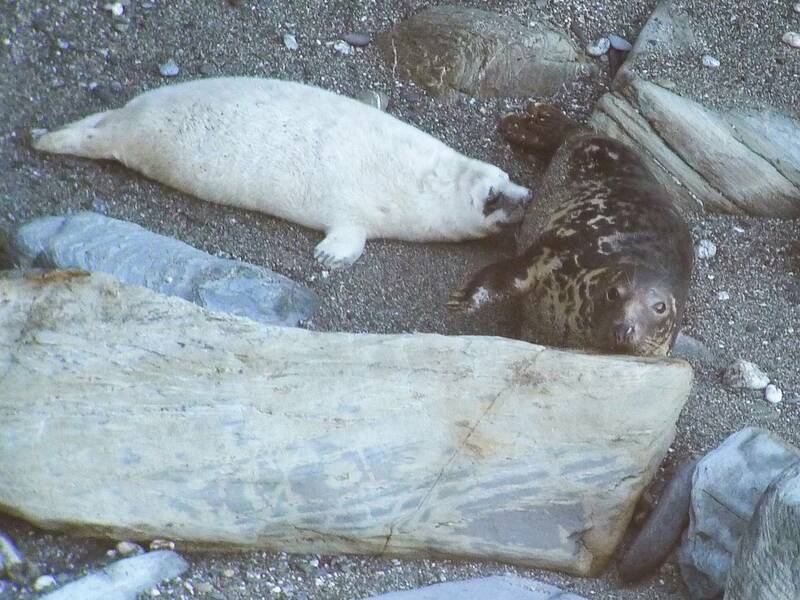 So Ghost is up to 14 pups in 14 consecutive years on exactly the same beach (bar the first which she had on the adjacent beach west). Of these we know 12 have been successfully weaned. 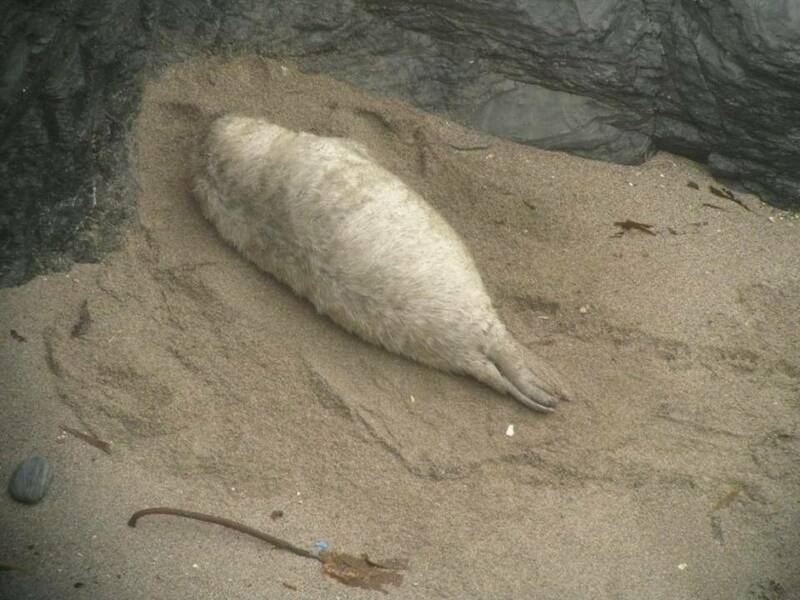 She is a record breaker in Cornwall and we would love to know if her record extends further than this…she might even be a world record breaking seal. Either way, she has a very special place in our hearts and the short time each year that we get to spend with her and her long legacy of pups. 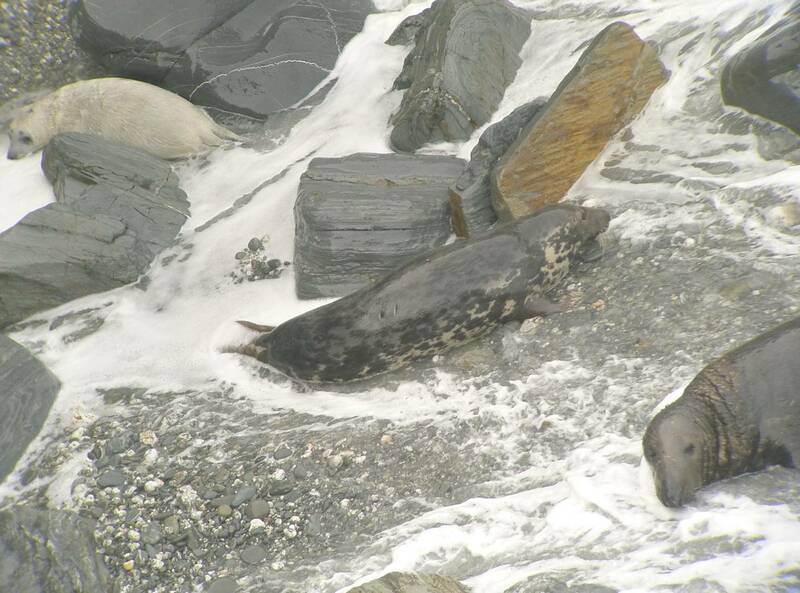 It would be awesome to find out where Ghost spends the rest of her year and whether some of the other mums we see on her pupping beach are actually related to her – it is possible that some are her own pups grown up. Long may we continue to learn from her exploits and experiences. 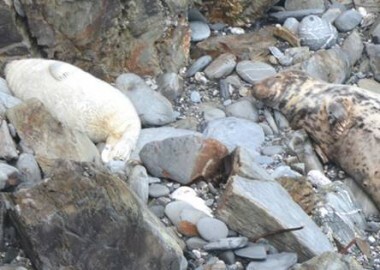 Ghost must be at least 20 years old now and the average life expectancy for female grey seals is around 30 years old.. With no menopause, ghost could conceivably continue having pups for some time to come. We certainly hope so! Will she make it 15 we wonder? 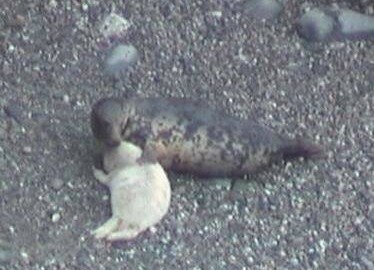 Celebrating our very special seal mum – Ghost and her 14th 2016 pup called Fleur! All photos by Sue Sayer unless stated. Special thanks to Simon Bone, Terry Hocking, Kate Hockley, Geoff Rogers, Peter Welsh and all our other volunteers who have helped us keep an eye on Ghost over the years. 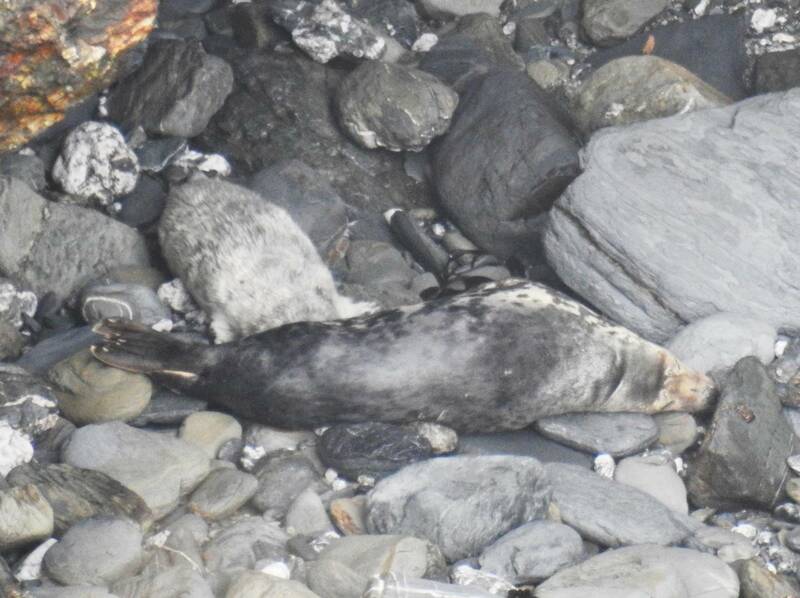 Also to Fleur Brochut, a student from the University of Neuchatel in Switzerland, who has been studying our seal pups in Cornwall for three months this season alongside CSGRT. 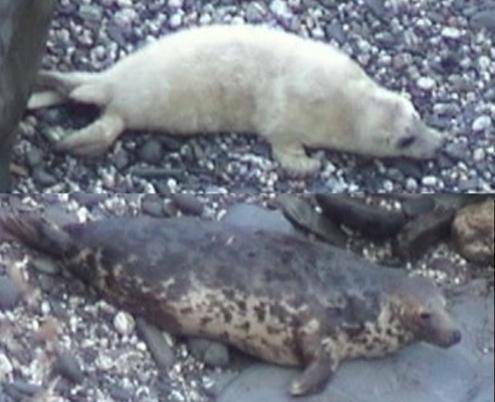 By coincidence Ghost’s 2016 pup was her favourite being born on the day she introduced her visiting father to Cornish seal pups! So Ghost’s 2016 pup was aptly named Fleur!